I got back to work after a week away and in my mail I discovered a new DVD from ONS. This was the CommuterView DVD I had been waiting for. What is it? 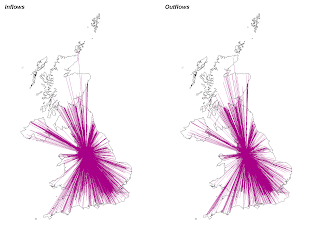 It's an interactive flow mapping tool showing all commuting flows in the UK from the 2001 census, down to LSOA level. It's very interesting and is similar to the kinds of things I've previously done with migration data. Another important development is that from April 1, 2008 the Office for National Statistics became the executive agency of the new UK Statistics Authority (UKSA). The UKSA is accountable to parliament rather than a government minister (as ONS was). The aim of this is to restore public trust in the quality and integrity of official statistics. They also have some pretty new logos. Yesterday I received an interesting e-mail from a PhD student at MacQuarie University in Australia asking about flow mapping techniques, but they are looking at communication linkages in settlements in Bangladesh rather than migration/commuting in the UK. I'm going to try and be of help as it sounds interesting and any kind of global communication on flow mapping is surely a good thing. What else? I've also been exploring the new tools available in Google spreadsheets and the 'heatmaps' in particular. These could be very useful tools indeed but I couldn't find a quick and easy way to resize my maps and there are still quite a few restrictions. Not a replacement for doing similar things in GIS but an interesting development. Still waiting on my new copy of Camtasia Studio 5. I'm working with 3 at the moment and plan to produce a 'how to use Camtasia' demo eventually - this will involve a screencast of screecast software. This is possible if you have two separate versions installed, just as it is possible to run Excel 2003 and 2007 on the same machine, for example. This map is an extract from a much, much larger dataset that has nearly 1 million flow lines in it. On the left the image shows inflows to Manchester from 2000 to 2001 and the other one shows outflows from 2000 to 2001. I like to think of this as the migration footprint of Manchester and even though many of the lines represent very little movement, the spatial extent is quite large. The message here, I suppose, is that everywhere is connected to everywhere else, but near places moreso (Waldo Tobler's First Law, anyone?). So, I'm into flow mapping, but only really as one more way of helping us to understand the way our world works. Although, I do have to admit that the nerd in me actually enjoys the technical side of it all too. There's really lots of different ways to do this kind of thing in GIS, but I used ArcGIS 9.x and Alan Glennon's Flowtools. I also hear that ONS are doing something similar to this with their new data visualisation unit - so have to see how that develops in due course. I've put a widget for this blog on my personal pages at the University of Manchester, which Alex Hardman pointed out to me. He's already nerdy but then it's all relative I suppose. Other than the VBA thing, I'm working on my screencasting project which I hope will end up being really helpful to students who need to use software in their courses but get stuck at some stage. This is a work in progress but things are going well so far. Essentially, it allows you to be in two places at once demonstrating a piece of software, or in the case of the above showing how to download data from an online data store. I suppose it really allows you to be in as many places at once as there are people using it. Isn't this the whole point of e-learning? As a result of my enthusiasm for screencasting, my interest in e-learning and the fact that I teach a range of different software skills at the University of Manchester (including GIS), I have embarked on an ambitious project which aims to produce lots of screencast content for students in the School of Environment and Development here. There's not really much more to say about it at this stage but I'll be writing more in the near future.